Pegasus TCS provide CNC turning services to help bring your parts and components to life. Our CNC (or computer numerical control) turning systems provide precision cuts allowing you to hold tighter tolerances than from a manual lathe. The process of turning is just that. A material is rotated and the cutting tool moving along 1 to 3 axes depending on the cut. Turning can make cuts on the exterior for a material as well as inside the material such as a tube. Using turning to make cuts internally is usually called boring. Below you can see a list of our CNC turning centers and manual lathes. Contact us today and let us quote your next turning project. 1 - CNC SL-400B/800 2001 Mori Seiki Slant Bed Turning Center 20" x 56", Faunc 18-IT Control, 4.53" Diameter Thru Bore, Programmable Steady Rest, Programmable Tailstock, 12 Tool Carousel, Tooling, Automatic Tool pre-setter, 3 Jaw Power Chuck, chip Conveyor. 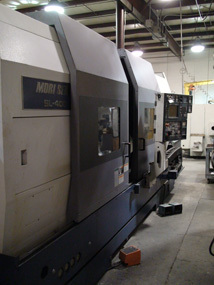 1 - CNC SL-400B 2001 Mori Seiki 20 HP Slant Bed Turning Center 12" x 18" with Fanuc 18-IT Control, Manual Steady Rest, Chip Conveyor, and Programmable Tailstock. 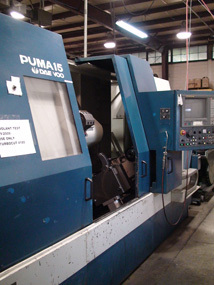 1 - CNC Dawoo Puma 15 Long Bend 2Meter Turning Center 20" x 46", Faunc 15-T Control, 3.03" Diameter Thru Bore, Hydraulic Steady Rest, Programmable Tailstock, 12 Tool Carousel, Tooling, 3 Jaw Power Chuck, chip Conveyor. 1 - CNC Dawoo Puma 12-LB Short Bend Meter Turning Center 18" x 36", Faunc O-T Control, 3.03" Diameter Thru Bore, Manual Steady Rest, Programmable Tailstock, 12 Tool Carousel, Tooling, 3 Jaw Power Chuck, chip Conveyor. 2 - CNC Dawoo Puma 10-HC Short Bend Meter Turning Center 10" x 26", Faunc O-T Control, 2.03" Diameter Thru Bore, Manual Steady Rest, Programmable Tailstock, 12 Tool Carousel, Tooling, 3 Jaw Power Chuck, chip Conveyor. 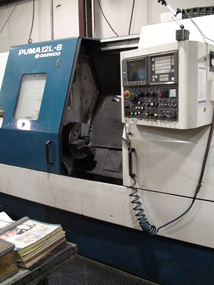 1 - Manual Lathe Willis MAMMOTH SK26 LATHE 20” Chuck x 70” between centers turning capacity. Manual Steady Rest. With Sony Digital X & Z readout. 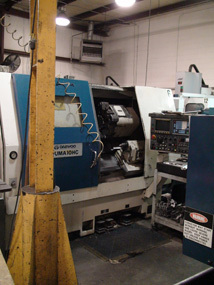 1 - Manual Lathe LEBLOND MAKINO LATHE 18” Chuck x 65” between centers turning capacity. Manual Steady Rest. With Digital X & Z readout.